Summary: the first visit of a reigning Saudi king to Moscow. Syria/Iran, oil, business on the agenda. Some unpublished detail. King Salman of Saudi Arabia arrived in Moscow yesterday 4 October for a visit which commentators rightly describe as historic. There is a good summary of the history of relations on the Al Jazeera website by Leonid Issaev of the Moscow-based National Research University. Saudi-Soviet relations were good until the Soviet ambassador who had good personal relations with King Abd al-Aziz was murdered in the Stalin purges in 1938. Diplomatic relations were never restored with the USSR, but were established with the new Russian Federation in 1991. Future kings Faisal, Abdullah and Salman visited Moscow, and President Putin visited Riyadh in 2007, but this is the first visit to Moscow by a reigning Saudi king. 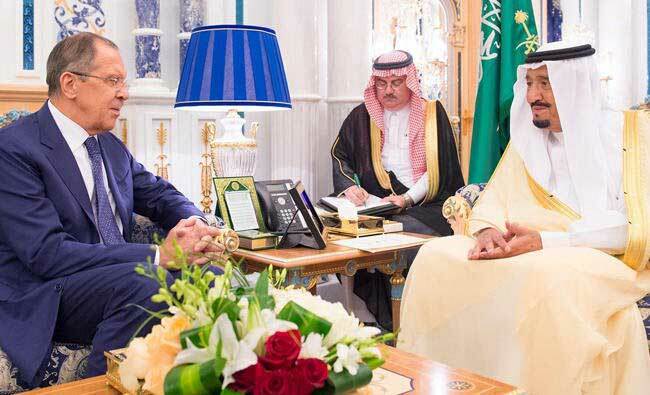 Crown Prince Muhammad bin Salman remains at home and in charge in the King’s absence, but Salman is accompanied by a large delegation, totalling 1,000 according to one anti-Saudi website quoting the Russian Sputnik website. The three main items on the agenda are expected to be Syria (and perhaps Iran), oil and business. It is normal for large deals and investments to take time, and Russian dissatisfaction is understandable, but as often happens the visit marks the conclusion of negotiations which have been continuing for some years. According to the CEO of the Russian Direct Investment Fund more than seven deals have been finalised; “the quantum of investment is close to a billion dollars, and it is in growth sectors.” The Russian energy minister said investment agreements will be signed “worth more than $3 billion” including a $1.1 billion petrochemical plant to be built in Saudi Arabia by Sibur. Further details of projects which have been under negotiation are contained in a leaked report (exclusive to Arab Digest) which according to the metadata on the file was submitted by an international consultancy to the Saudi Public Investment Fund on 23 Jan 2016. Did you know we also produce a specialist newsletter exclusively about Saudi Arabia? Contact the editor for details.